When Aerosmith last toured North America in 2010, the outlook if they would tour ever again was looking bleak when they ended their tour in Vancouver. Singer Steven Tyler was about to embark as a judge on American Idol and guitarist Joe Perry was none too happy at the way it all went down. Luckily cooler heads prevailed and Aerosmith has reconvened and just fired up their latest tour. The Global Warming Tour, quite appropriately named as temperatures peaked at 92 in sultry downtown Cleveland. Despite this being just the second show into the tour, Aerosmith really showed no rust as they played nearly a two hour show. Greeting the crowd with “Draw The Line” the title track of their 1977 album, the band forged ahead and treated the crowd to a new song early on in the form of “Oh Yeah” from the forthcoming album Music From Another Dimension. One new twist on this tour is the addition of two female background singers who helped enhance a few of the songs such as the old standards “Cryin” and “Love In An Elevator”. Fans of the 1973 debut, were treated to three tracks, a rare feat in itself considering all the material the band can choose from. As far as gems go, the band did not disappoint as “S.O.S. (Too Bad)”, a snippet of the classic “Mother Popcorn” and the Perry lead vocal of “Combination” from the Rocks album were all played. During the encore a piano appeared at the front of the ramp that extended out into the middle of the crowd. As Tyler pounded out the first verse of “Dream On” on the keys, Perry came out to join him and the crowd ate it up. The show closed with their long time staple “Train Kept A Rollin”. Opening the show were the savvy band from Rockford, Illinois, Cheap Trick. Guitarist Rick Nielson and Company opened with a raucous “Gonna Raise Hell” and proceeded to put on their usual solid performance. This time around they played rare songs “Elo Kiddies”, “Way Of The World” and a stunning “Heaven Tonight” that satisfied those fans who crave a little deep cut action. Robin Zander still sounds as good as ever, it seems he never ages. As he does every show, the inventor of the twelve-string bass Tom Peterson stepped up to the microphone to sing his signature song “I Know What I Want”. Bun E. Carlos while still maintaining membership within the band, no longer tours with Cheap Trick. Rick’s son Daxx Nielson has stepped in as the touring drummer and does quite an admirable job as the band carries on without any hiccups. After all the changes Aerosmith has endured throughout the years, to still have every member from the original lineup is a testament to itself. Drummer Joey Kramer and bassist Tom Hamilton form one of the tightest rhythm sections around. Perhaps the one member of the band who seems to hide in the woodwork so to speak is Mr. Brad Whitford. Whitford just goes about his business and plays his fills and occasional leads like he did during “Last Child” a song that he co-wrote with Tyler dating back to the Rocks album. The relationship between Perry and Tyler is very unique and at times unpredictable. Formerly known as the Toxic Twins, Tyler and Perry have had their share of disagreements over the years. Tyler asked the crowd at one point if that was why they enjoy Aerosmith, because of all the drama associated with the band. 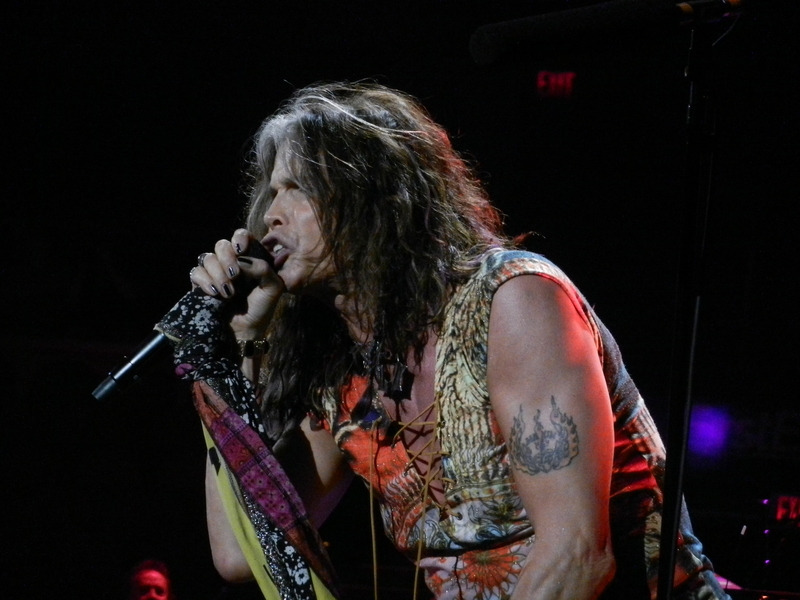 Steven also quipped to the crowd to keep an eye on Joe Perry tonight as you may actually see him smile. For the fans in attendance at “The Q” they were the ones left smiling as they got to see two bands who still can deliver a top notch performance even this far along in their respective careers.